Hudson New York Jewish Wedding. 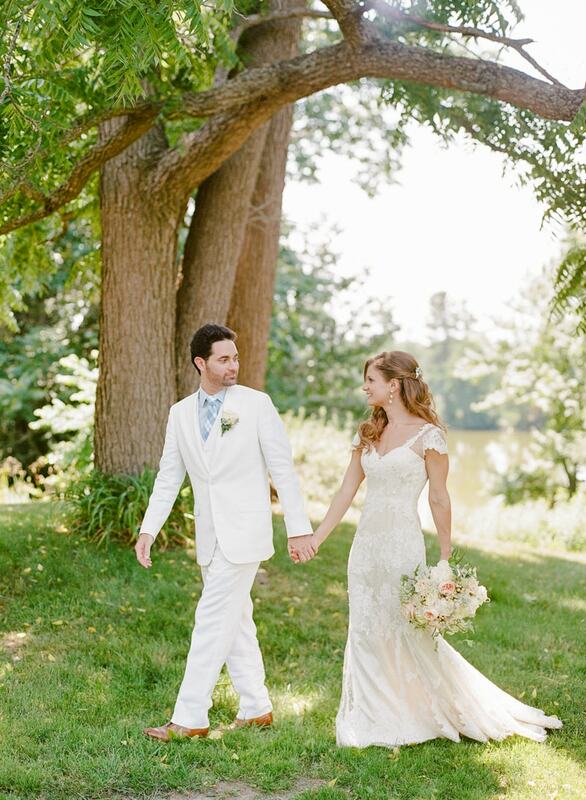 Melanie and Greg planned a bright and airy wedding day at The Hill in New York’s Hudson Valley. With expansive views of The Berkshires and Catskill Mountains, everyone in attendance would be treated to quite the outdoor experience. The day was designed around light blue, gray, and pink hues. And these pastel colors were everywhere from the attire, to the venue, to the flowers. Melanie wore a figure-flattering lace V-neck gown with cap sleeves and gorgeous detail. Her hair was pinned up on one side with loose curls flowing past her shoulders. Her bouquet was a delicate mix of blush garden roses, white roses, Queen Anne’s lace, ivy, and hypericum berries. 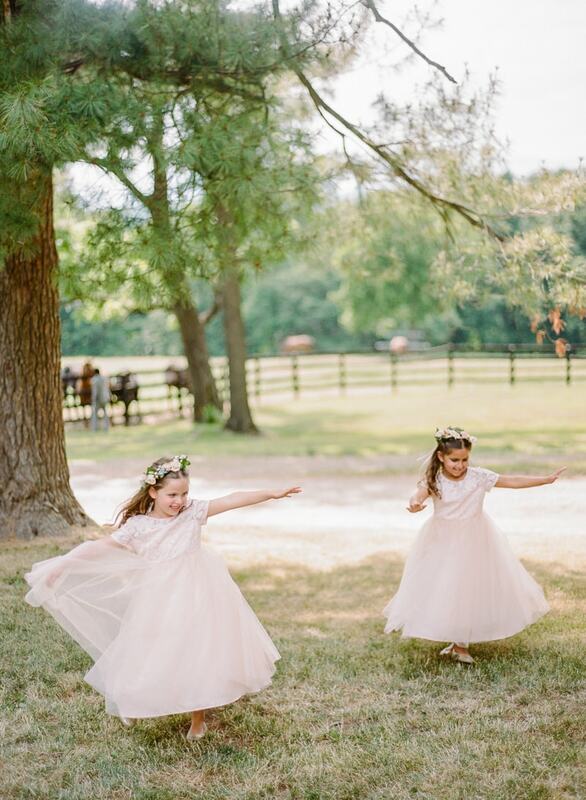 Two flower girls were bursting with excitement, too, in their fluffy pink dresses and floral crowns. Groomsmen looked handsome and dapper in gray suits with pink ties and pocket squares, while the bridesmaids coordinated beautifully with blush and gray sweetheart style dresses. The couple opted for a first look moment before the ceremony. Positioned under a picturesque canopy of trees, Greg turned around to see his bride for the first time. He looked impeccable in a white suit with a light blue shirt and patterned blue and white tie. As he spun around, the sight of Melanie in her gown brought Greg to tears. For the ceremony, Melanie wore a traditional veil with lace trim. 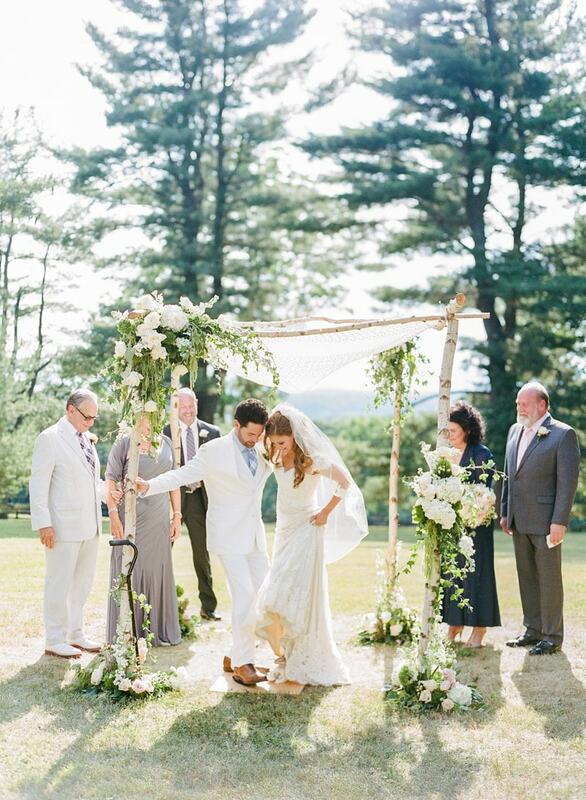 With the sun beams jetting through the tree tops, the bride and groom were wed in front of family and friends during a traditional Jewish ceremony, complete with a chuppah. It was built with strong birch branches, a fabric canopy, and sweet floral arrangements on both sides. Through claps and cheers, they sealed their promises with a sun-drenched kiss. The reception took place under the Palladian Barn, a light blue dreamy structure. Guests mingled outside where they enjoyed rocking chairs and lawn games and went inside for dinner and dancing. A gray runner accompanied white linens for a clean look. Floral arrangements in wooden planters were placed down the center and clear plates were at each place setting. The couple displayed cherished wedding photos from family members as guests walked in. The barn’s ceiling was glittering with Edison lights and below the glow were long reception tables. The couple enjoyed a romantic first dance as husband and wife, immersing themselves in each other’s eyes. They cut into a charming two-tier buttercream cake garnished with flowers and topped with personalized wooden cake toppers. But the most memorable part of the evening came when the group sat around a bonfire under the bistro-lit trees. A group of family and friends grabbed their instruments and regaled the group with their songs, carefree and completely authentic. Melanie and Greg may have been chilly when they got engaged, but everyone could feel the warmth - in their hearts and souls - on their resplendent wedding day. The Proposal: Melanie and Greg’s road to wedded bliss was dotted with unforgettable experiences, growing pains, distance, and finally, a rekindling on a cold night that proved to be the start of something infinite. When Greg was ready to propose, he stopped at a beloved cheese shop the couple would frequent on the way to Melanie’s parents’ house. But on the way back, he took a detour and wanted to pause at an overlook near New Paltz, N.Y. One problem: they were freezing cold. They walked and talked and Greg got down on one knee. They celebrated with a quick sip of champagne before retreating back to the warmth. 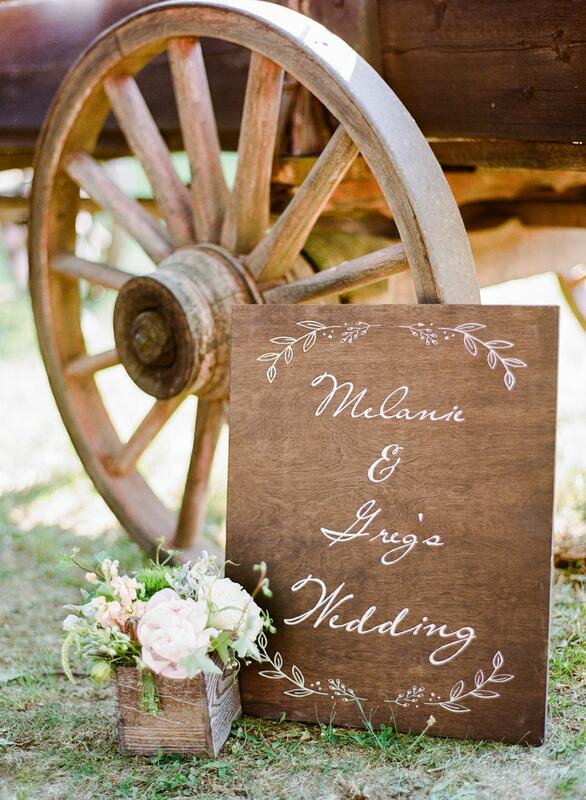 It was romantic, intimate, and incredibly special for the upstate-loving Melanie. Featured in Trendy Bride's Winter/Spring 2017 issue.